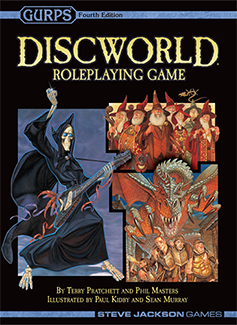 Daily Illuminator: Flatten Your World With Discworld Roleplaying Game! December 26, 2016: Flatten Your World With Discworld Roleplaying Game! You've no doubt read the astounding and unique tales of Discworld from Terry Pratchett. Now you can live them, with Discworld Roleplaying Game Second Edition! Man, is this book big! It has 400+ pages of Discworld content that has been carefully curated by Phil Masters. This lovingly crafted tome lets players and GMs use the Disc as their playground. Explore the notorious city of Ankh-Morpork, campaign for goblin rights, or flee from the angry Swamp Dragon. The world with the only turtle to form the basis for an entire branch of astrophysics is truly open to you in Discworld Roleplaying Game! While it's compatible with GURPS Fourth Edition, this is a stand-alone book that can be played completely on its own. So even if you're new to GURPS, it's a perfect place to start! Find your ride to the Disc at your friendly local game store today! Just remember, the world is round. And also flat.